Director: Tim Story. 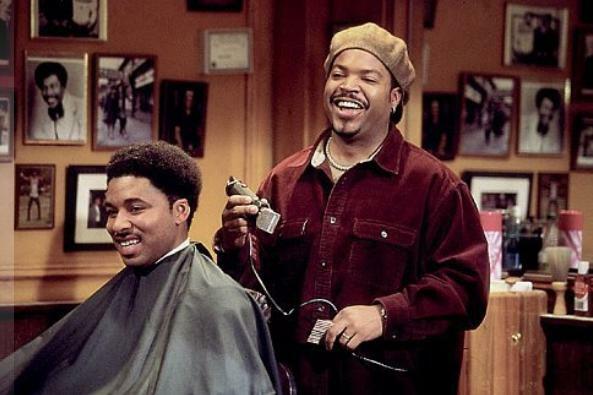 Cast: Ice Cube, Cedric the Entertainer, Anthony Anderson, Lahmard Tate, Michael Ealy, Sean Patrick Thomas, Eve, Leonard Earl Howze, Troy Garity, Jazsmin Lewis, Keith David, Carl Wright, Tom Wright, Jason George, DeRay Davis. Screenplay: Mark Brown, Don D. Scott, and Marshall Todd (story by Mark Brown). Are you watching, Frank Darabont, Robert Redford, Lasse Hallströmall you "liberal" Hollywood directors who have had the hankering to show us some purported truth or vision about black life? This is what can happen when black actors and black filmmakers are permitted by a narrow industry to assemble a story of their own, a depiction of their own community. Gone, at least for the moment, are the platitudes about everyone being the same, as well as the melodramatic or quasi-supernatural reminders that actually, maybe, some people really are differentmore spiritual, more pitiable, more noble in their suffering. Gone too is the implication that one story about an African-American person or neighborhood must be taken as definitive for the population at large. And gone is the sulphury atmosphere of self-importance, in which Kevin Kline or Tom Hanks or some scion of wise humanity prescribes the cure for the problem of race (which thus cannot stop advertising itself as a problem). Instead, we have Barbershop, and all of the humbly convention-busting energy that the titular locale impliesa range of types and viewpoints, a spectrum of notes and tones, a merging of the serious with the frivolous, all combining but never homogenizing into an actual village voice. This is a marvelous context for telling a story by, for, and about black people, because it is a marvelous way of telling a story. Ice Cube, a decade after contributing Boyz N the Hood's most affecting performance, stars here is Calvin, who is still struggling to make that leap into the world of adultz. Refreshingly, he is not trying to leave the hood, a low-income terrain of gridded streets, triple-padlocked stores, and higher-than-average crime that is nonetheless depicted as nobody's hell and which no one appears especially anxious about inhabiting. Calvin has other things to worry about. His nascent business as the impresario of an in-house recording studio has literally blown a fuse, again. This means that the business he already operates and manages, a black-targeted neighborhood barbershop he reluctantly inherited from his late father, will continue to own him from early morning until the never-too-soon dinner hour. It seems, in Calvin's boredom and frustration, that an entire fleet of people conspire to trap him in this profession. His pregnant wife Jennifer (Jaszmin Lewis) understandably wants a steady income (but, imagine, she is not a bitchy, spendthrift money queen! ), and his employeesincluding a two-time theft offender (who, imagine, is neither saint nor demon), a college-educated know-it-all (who, imagine, is not once derided as effeminate), and a hotheaded women's stylist fed up with her boyfriend (whose sexism, imagine, is vilified while her own beauty is appreciated)they all of them need the structure and the salary that Calvin's perceived self-indenture provides them. What transpires over the 24 hours of Barbershop's narrative is Calvin's epiphany that a neighborhood is more than the mere spectacle of people around you, that a legacy is more than a burden, that immediate gains can never be the equal of collective consideration, the integrity of good workmanship, the refining of a skill, the responsibility of a citizen. These would be medicinal lessons in a commercial film if so much of the culture weren't so oppositionally brazen about championing quick cash, easy indulgence, and narrow frames of reference. Even still, they might have felt arrogant or alienating to a populist audience were they not delivered in as hilarious, crisply characterized, and reasonably paced a vehicle as this one. Of course there is traffic in stereotypes, and yes director Tim Story and his trio of screenwriters luxuriate in a few overlong gags and some fairly routine plot dynamics. But the overfamiliarity of some obesity jokes and predictable hijinks hardly count against an African-American movie brave and spunky enough not only to comically interrogate the mythologies around some sacred cows (Rosa Parks, Rodney King, the O.J. verdict) but to specify these uproariously unexpected remarks as exactly the kind of "free speech" that a neighborhood barbershop is special for sanctioning. I'm glad I was able to enjoy these jokes before all the hoopla about their purported scurrilousness; it seemed infinitely clear to me, as it still does, that a single character's uneven respect for individual figures is nothing compared to Barbershop's overarching belief in public venues that enable jocular discourse, communal self-scrutiny, and open dialogue...and besides, I'm supposed to take Jesse Jackson seriously as a critic in these matters, he who sold his name to Miramax to sell Chocolat as a peerless parable of tolerance?